After an artist has died, the value of their work usually increases. Its morbid thought that the end of creativity will make the existing creations a financial gain. Despite this analogy, those of us who appreciate art are happy to go see the paintings, sculptures and installations – but rarely does something get created after the fact. 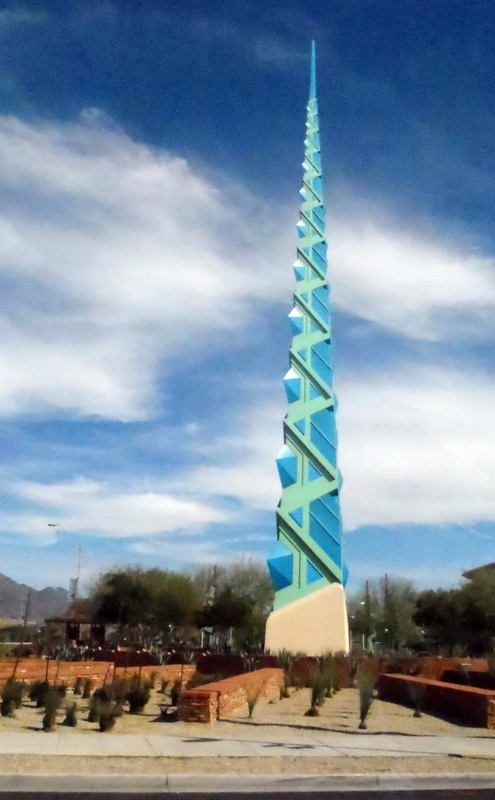 But in north Scottsdale, a bright blue spire at the corner of Frank Lloyd Wright Road and Scottsdale Road was a design created by architect Frank Lloyd Wright in the 1950s, but only built in 2004. The spire was a proposal by Frank Lloyd Wright for the Arizona State Capitol which was rejected. And decades later, this 125 foot steel and glass structure was constructed and installed, a bold beacon of the desert. I was struck by its colour, a compliment to the surrounding shades of cream, brown, beige, red and green of the desert, as well as a match to the sky. And I loved that it wasn’t part of anything – it wasn’t in the entry way of a local office building, art gallery or government building – it was just solo, standing tall on its own next to a shopping mall parking lot.